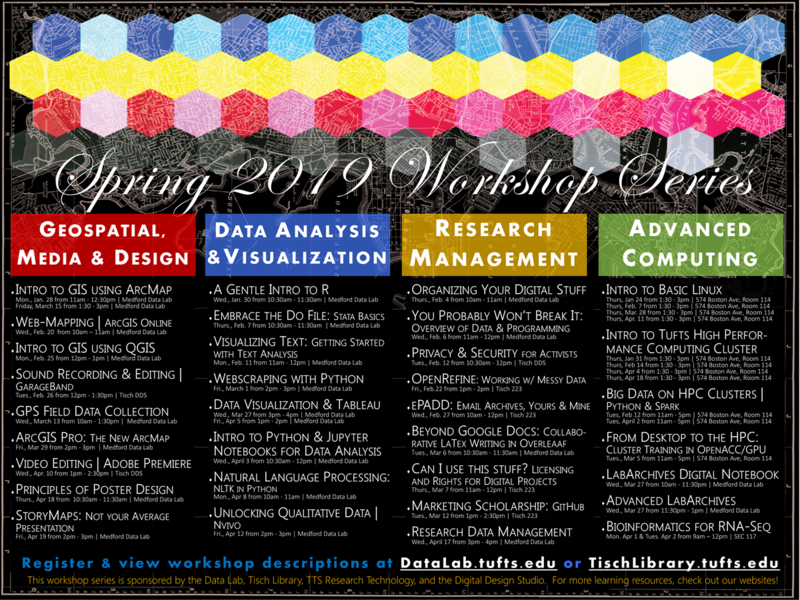 The Data Labs, TTS Research Technology, Digital Design Studio (DDS), Tisch Library, Ginn Library and Hirsh Health Sciences Library provide a variety of short workshops for Geospatial Technologies, Statistics, Data Analysis and Management, Data Visualization, Design, and Digital Humanities. Please contact the Data Lab Support email list at DataLab-support@elist.tufts.edu if you would like to schedule a specialty workshop. If you are new to Linux environment and Tufts HPC cluster, this is a great place to start! This is designed to be an introductory level workshop on Basic Linux (the command line environment and some useful commands). **Required** This is a hands-on workshop and we will be using Tufts HPC cluster for demonstration purposes. If you don’t have a cluster account yet, please fill out the following form at least one week previous to the workshop: Request account for Research Computing Cluster . No previous Linux experience is required. Please bring your own laptop. Interested in learning the basics of Geographic Information Systems (GIS), but couldn’t get into the class? Come join us for a quick workshop and learn the basics of adding and symbologizing data, querying attribute tables, and creating a final map product for publication in ESRI ArcMap. This workshop is designed to get you started with the statistical programming language R. We provide an overview of the R language along with the RStudio interface. During the session, we use datasets built into RStudio to introduce importing data, performing descriptive statistics and making simple visualizations to get you familiar with working in R. This workshop is suitable for those who have not worked with R/RStudio before. No previous statistical experience is required for this session. If you are new to Tufts HPC cluster, this is a great place to start! This workshop is a brief introduction of the structure of the Tufts HPC cluster (different nodes, different partitions, storage options, and available software,.etc), as well as the basic usage of it’s scheduler “SLURM”. **Required** This is a hands-on workshop and we will be using Tufts HPC cluster for demonstration purposes. If you don’t have a cluster account yet, please fill out the following form at least one week previous to the workshop: Request account for Research Computing Cluster . Basic Linux knowledge is required. If you are not familiar with Linux, please check out our “Introduction to Basic Linux Workshop”. Please bring your own laptop! We all have a growing collection of digital files – documents and notes, data files, charts and graphs, pictures… the list is endless! In this workshop we will talk about strategies and tools that you can use to keep track of all of your work so that your files are easy to find and safe. Interested in getting started with data analysis, coding, or just want to get more comfortable with your computer? Join us for a gentle introduction to the tools available for different tasks you might be learning about. This session will have no prerequisites or expected knowledge – show up as you are and feel comfortable asking whatever questions you have. This workshop is designed to get you familiar with the Stata. We provide an overview of Stata interface and basic functions. During the session, we introduce some descriptive statistics commands and recoding commands to help you gain familiarity with Stata syntax. This workshop is suitable for those who have not worked with Stata before or those seeking a refresher session. **Required** This is a hands-on workshop and we will be using Tufts HPC cluster for demonstration purposes. If you don’t have a cluster account yet, please fill out the following form at least one week previous to the workshop: Request account for Research Computing Cluster . No previous Linux experience is required. Please bring your own laptop. You’ve heard of close reading, but how about distant reading? Want to learn how to visualize thematic patterns across Shakespeare’s plays? Presidential speeches? Newspaper articles? Thousands or millions of texts? This workshop will provide an introduction to some simple, free web-based tools for text analysis and visualizations that you can bring into your research and classes. No programming experience required. You have a right to exist safely in digital spaces. Although we have to rely on outside parties for technology to access these spaces, there are tons of helpful tools and strategies that allow you to take greater control of your digital life and mitigate the risk of malicious threats. During this workshop, we’ll walk through common areas of digital life such as web browsing, private data, and smartphones to show you different ways that you can implement as much or little security as you’re comfortable with. Thanks to Hack*Blossom’s DIY Guide to Feminist Cybersecurity for this workshop description! 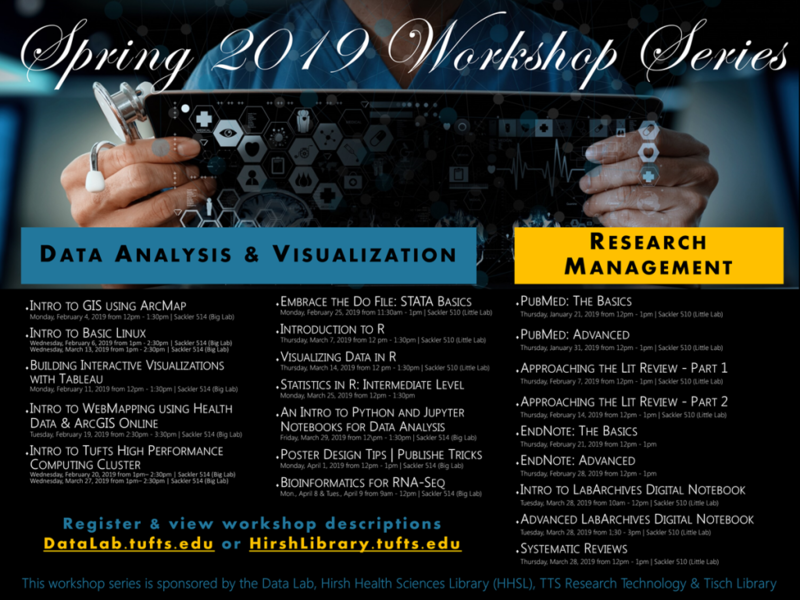 Tufts Libraries and Tufts Technology Services are pleased to present a Social Science Data Carpentry workshop covering Organizing Data in Spreadsheets, OpenRefine, and R on the Tufts Medford Campus. Data Carpentry workshops, part of the larger Carpentries organization (https://carpentries.org/), are designed to teach foundational coding and data science skills to researchers. The lessons are designed with discipline-specific research in mind and are used world-wide. No previous experience with any of the tools being taught is expected and you don’t have to be a social scientist to attend. The course is aimed at graduate students and other researchers. You don’t need to have any previous knowledge of the tools that will be presented at the workshop. More information is available at https://nesclic.github.io/2019-02-15-tufts/. In today’s day in age, static paper maps can only get you so far. Online web-maps allow viewers to engage with spatial data in an interactive manner, allowing for more in depth analysis and storytelling. In this introductory workshop, we will learn how to use ArcGIS Online to add layers to the map, configure pop-ups to make your map features informative, and present your map with a finished look and a nice user experience for mobile applications or embedding into websites. So you found a dataset, but it doesn’t quite work for you; now what? Never fear! We have lots of tips and tricks that you can use to clean up a messy data set, adjust the data to line up with what you already have, or just reduce the size of the dataset to only include what you need. We will look at how you can use Excel and OpenRefine to evaluate and work with your data. Wouldn’t it be great if ArcMap was less expensive, open source, and more versatile? Never fear, QGIS is here! QGIS is a free, open-source software that allows you to create, edit, visualize, analyze and publish geospatial information on Windows, Mac, and Linux platforms. This workshop will cover introductory GIS concepts using QGIS. In this intro workshop, you’ll learn how to stylize layers, make selections, set your projection, and create a final map composition in QGIS. In this workshop you will learn recording tools and strategies to build a short project through exploratory listening. We will use GarageBand but skills are translatable to software such as Audition, ProTools or Logic. We will cover basic media management, starting a new project, importing, editing techniques, and exporting. Demo media will be provided. Join Digital Collection and Archives (DCA) staff to learn how to use a tool developed by Stanford, ePADD, to easily conduct research in email collections held by DCA and other archival repositories. You will also learn how you can use ePADD to save, organize, find, and perhaps eventually donate your own email to an archives. Want to download lots of info from a website, but copy and paste won’t cut it? This workshop will teach you the basics of web scraping, or extracting text from a website with the programming language Python, and the libraries requests and BeautifulSoup, using web scraping texts from Project Gutenberg as an example. Interested in exploring an online tool for simple, collaborative scientific and technical writing? Learn how to use Overleaf to make the process of writing, collaborating, and publishing scientific documents in LaTeX quicker and easier. Overleaf is a browser-based editor that allows direct code editing and a Rich Text formatter that does the work for you. Collaborate with colleagues, find templates for major journals, and format bibliographies. Are you planning to incorporate images, text, data, or other material created by someone else into a project, and wondering what’s allowed? Are you interested in learning more about your rights to your own work? This workshop will provide an introduction to copyright, Fair Use, and licenses in order to facilitate creating and sharing your project. Creating a website to showcase your research interests and outputs is one of the most powerful ways you can establish yourself in your field. During this workshop, you will become familiar with GitHub Pages, a super easy—and super sustainable—platform for developing your scholarly online presence. GPS is changing the way users collect and manage geographic data. From handheld units to smart phones, GPS units make it extremely convenient to record locations in the field while simultaneously collecting survey information (e.g. water quality data, questionnaire responses, etc). In this workshop, students will learn how to prepare a field data collection sheet, use Garmin GPS units to collect data, download the data and join survey responses, and import the results into Google Earth and Google Maps. No GIS experience required. Designed to replace paper notebooks, a LabArchives Digital Notebook can be used to document ideas, notes, research, experiments, and procedures. They are designed for intuitive use, ease of search, copying and versioning. They support collaboration with many users and includes access controls. In this workshop you will be provided an overview of the LabArchives Digital Research Notebooks. We will go over the feature tools and show you the benefits of moving from a paper to a Digital Notebook. Computers will be provide during the training session but feel free to use your laptop. And your Tufts account is required to log into the LabArchives Digital Notebook solution. In this workshop, we will explore advance sharing with group management and widgets to create customized forms for data entry. Focused items are creation of research group specific forms and database for Chemical Inventory and Freezer Box. Computers will be provide during the training session but feel free to use your laptop. And your Tufts account is required to log into the LabArchives Digital Notebook solution. Charts, graphs, maps, and infographics are a great way to communicate research, but not all visualizations are created equal. In this workshop we will talk about the ways that you can create truthful and effective visualizations and look at a series of examples to see how visualizations can go terribly wrong. We will also start to work with Tableau to make attractive visualizations. Just when you finally get ArcMap down, they develop a new platform for ArcGIS! A new ribbon based and map centric product, ArcGIS Pro has all the tools you’ve come to know and love, plus it’s easier to use than ArcMap (once you get used to it). Come learn the future ESRI… you might like it more than you think! This is a hands-on workshop designed to get you started analyzing data using Python and Jupyter Notebooks. We will provide a whirlwind overview of what Python is (and isn’t) and why you might want to use it to look at your data. Then we’ll dive into some programming basics and discuss: What are variables and how do I use them? What other data structures are available? Essential Python packages for data analysis (NumPy, Matplotlib, Pandas, and more) and how to import them. The basics of visualization with Matplotlib. How do I import my data? No previous programming experience is required for this workshop, and computers will be provided through the Data Lab. If you already have some data that you would like to explore, there will be time to do so at the end, so please feel free to bring it along (preferably in Excel or CSV format). Sample datasets will also be provided. Basic Linux knowledge is required. If you are not familiar with Linux, please check out our “Introduction to Basic Linux Workshop”. Please bring your own laptop! Want to find names or places mentioned in hundreds, thousands, or millions of texts? Want to find particular adjectives in tweets to learn how people feel about an event or topic? This workshop will teach you the basics of NLTK in Python, using the novel Frankenstein as an example, to help you learn what you can do with a computer and a lot of words. In this workshop you will learn editing tools and strategies using found media with the aim of understanding different ways one could approach the footage. We will cover media management, starting a new project, importing, editing techniques, and exporting. Demo media will be provided. Tufts Libraries and Tufts Technology Services are pleased to present a Software Carpentry workshop covering the Unix shell, Git, and Python on the Tufts Medford Campus. Software Carpentry workshops, part of the larger Carpentries organization (https://carpentries.org/), are designed to teach foundational coding, and data science skills to researchers. The lessons are used world-wide. No previous experience with any of the tools being taught is expected. The course is aimed at graduate students and other researchers. You don’t need to have any previous knowledge of the tools that will be presented at the workshop. Information and Registration is available at https://nesclic.github.io/2019-04-12-tufts/. Data is an essential part of your research, but keeping track of it can be tricky and data management plans are an increasingly important component of project planning. In this workshop we will talk about the tools and strategies that you can use to manage your data from collection all the way through to when you want to put it somewhere to be preserved. An interactive session on elements and principles of poster design. While these principles are applicable regardless of what software you design in (or even non-digital design), we’ll make use of the easy to use, free web-based application Canva. Sick of using only PowerPoint to make presentations? Esri Story Maps are web applications that let authors combine beautiful, interactive maps with narrative text, striking images, and multimedia including video. Impress your professors, bosses or friends with these attractive and easy to use applications while bringing your story to life. Story maps can be embedded in web pages and truly up your presentation game! This workshop will introduce you to PubMed. We will review the content of this database, planning and executing a search strategy, narrowing search results, finding full-text, and exporting results to a citation management program. Interested in learning the basics of Geographic Information Systems (GIS), but couldn’t get into the class? Come join us for a quick workshop and learn the basics of adding and stylizing data, querying attribute tables, and creating a final map product for publication using health data. In this workshop, you will learn how to approach the literature review. Topics covered include: database selection, constructing effective searches, limiting articles to relevant studies, and tools for keeping track of results. Charts, graphs, maps, and infographics are a great way to communicate research, but not all visualizations are created equal. In this workshop we will talk about the ways that you can create truthful and effective visualizations and look at a series of examples to see how visualizations can go terribly wrong. We will also start to work with Tableau to make attractive and interactive visualizations. In today’s day in age, static paper maps can only get you so far. Online web-maps allow viewers to engage with spatial data in an interactive manner, allowing for more in depth analysis and storytelling. In this introductory workshop, we will learn how to use ArcGIS Online to add health data to the map, configure pop-ups to make your map features informative, and present your map with a finished look and a nice user experience for mobile applications or embedding into websites. R is an open source programming language used to manipulate, analyze, and visualize data. In this hands-on workshop, users will be introduced to R packages used for data visualization. This session includes data visualization exercises utilizing a sample data set. Prior experience with R or completion of the Hirsh Library’s “Introduction to “R” open workshop is recommended but not required. This workshop is designed for students who have taken a statistics course and have been introduced to R in the past. It is designed to work through writing and running more advanced code in R to complete intermediate statistical analyses such as linear regression models. This is not an introduction workshop to statistics or R.
Designed to replace paper notebooks, a LabArchives Digital Notebook can be used to document ideas, notes, research, experiments, and procedures. They are designed for intuitive use, ease of search, copying and versioning. They support collaboration with many users and includes access controls. In this workshop you will be provided an overview of the LabArchives Digital Research Notebooks. We will go over the feature tools and show you the benefits of moving from a paper to a Digital Notebook.Computers will be provide during the training session but feel free to use your laptop. And your Tufts account is required to log into the LabArchives Digital Notebook solution. What are variables and how do I use them? What other data structures are available? Want to learn how to make really attractive posters, but don’t have the time to learn InDesign. Do you know how to use PowerPoint and Word already? Then publisher is the perfect platform for you! This workshop will discuss design concepts and go over tips and tricks for using Microsoft Publisher. You’ll be making stunning posters in no time! High throughput RNA sequencing allows genome-wide investigation of gene expression and regulation. However, designing an experiment and choosing the right tools for analysis can be challenging. This two-day course aims to teach the basics of obtaining and analyzing RNA-seq data: Experiment design, quality control, alignment and visualization of reads and differential expression analysis. Analysis will be done with tools available on the Tufts High Performance Compute Cluster and example code and tutorials will be available at https://sites.tufts.edu/biotools/tutorials/. Designed to replace paper notebooks, a LabArchives Digital Notebook can be used to document ideas, notes, research, experiments, and procedures. They are designed for intuitive use, ease of search, copying and versioning. They support collaboration with many users and includes access controls. In this workshop you will be provided an overview of the LabArchives Digital Research Notebooks. We will go over the feature tools and show you the benefits of moving from a paper to a Digital Notebook. Computers will be provide during the training session but feel free to use your laptop. And your Tufts account is required to log into the LabArchives Digital Notebook solution. In this workshop, we will explore advance sharing with group management and widgets to create customized forms for data entry. Focused items are creation of research group specific forms and database for Chemical Inventory and Freezer Box.